I’ve just been on my first cruise and it was an absolute blast! (Anything that offers unlimited amounts of food is alright in my book.) I did plenty of research before I embarked, but here are a few things I think everyone should know before they set sail on their first cruise! If your cruise offers a dining option that allows you to eat on your own time, I highly recommend you choose that option. Most cruises offer two or three dining times and you eat dinner the same time each night. The benefit to this is you’ll have the same waiter each night, so food allergies & dietary requirements don’t have to be explained to the wait staff every night. However, even if you’re not hungry, your dinner time is set. Some days I would sleep in, eat a late breakfast and then a late lunch. If my dinner time was at 6:00PM I would have had to either skip the main dinner that night or eat even if I wasn’t hungry. To me, the flexibility of eating on my own time outweighed the benefit of having a waiter that knew me by name. My mom and me on the ship's heliport! Take a little time at the beginning of your voyage to explore the whole ship. It will make your life much easier knowing where everything is. Cruise ships are huge, and seem to be getting bigger and bigger! Don’t be late to a show one evening because you don’t know where the theatre is. This initial exploration can also show you things on your ship you didn’t even know were available. Imagine going on a cruise and not learning until the last day that there was mini-golf on board! You’re on vacation, the perfect time to expand your mind and test what you think you know! Try and speak the language when you’re in port, talk to people you’re sitting next to at dinner, or try some food you’ve never had before! Never had escargot? A cruise is a great time to try it, since food is free! That way, if you don’t like it, at least you didn’t pay extra for it. This tip is two-fold. First, give yourself time. While it’s tempting to run around and try everything the ship has to offer, don’t forget to take a seat and relax for an hour. Look out at the sea and do nothing. Bask in the sun and forget the world exists for a little while. Second, literarily give yourself plenty of time. If you’re not on the ship by the time it leaves port, it’s not going to wait for you. Your smart phone tends to not be very smart when it comes to being in a new county, so bring a watch and set it to ship's time. The ship always stays on the same time, not the time of the country you’re visiting. When in port, get back to the ship with plenty of time to spare. The last thing you want to see is the ship in the distance and you still on dry land. The ship sends out a daily newsletter with everything happening on the ship that day. Keep informed of all the events, showtimes, and port information as they change from day to day. It also lists the hours of operation and any special events happening that day. Before you even leave for your trip, make sure you read over all the information the cruise line gives you regarding your embarkation. It walks you through everything you need to know from check-in times, to what documents to bring with you to board. A day or two before your cruise ends you’ll also get some kind of pamphlet put in your room with all the disembarkation information. I highly recommend you read this thoroughly. The more you know, the smoother it will go! Further, if you pack light and are able to carry all your own luggage, you can get off the ship at the end of your cruise whenever you please. The ship will usually offer a service in which they’ll take your luggage for you and you’ll get it back in the terminal. That just adds one more headache you can avoid if you pack light and carry it yourself. Tipping is one of the most talked about topics when it comes to cruising. Do you tip? How much? Who do you tip? In recent years, many cruise lines have begun automatically adding in a daily “Service Charge” to your bill of $12-$15 per person, per day. This is partially because many more Europeans are cruising that aren't accustomed to tipping. What does this mean for you? While I am not a cruising expert, my research has suggested: no one really knows. A quick Google search on this topic will result in a myriad of different opinions, all from seemingly reputable sources. My thought is this; the service charge will serve as a baseline of sorts. If the service you receive is exemplary, feel free to give that crew member a little something extra for going above and beyond. It should be noted, however, that many large cruise lines don’t pay the crew exceedingly well, especially by US standards. Use common sense and do what you think is right. If you’re pretty easy going and don’t ask for a lot, give them a little something extra. If you’re a giant pain in the you-know-what and ask a lot from your wait staff and your room steward, give them a bigger tip. As I used to work in the hotel business, I know how hard the housekeeping and restaurant staff works. I always leave my room in almost untouched condition and do pretty much everything except make my own bed. The best advise I can give is to do a little research on your specific cruise to see what their policies are. Some luxury cruise lines don’t even allow tipping on board. Remember, a tip is not mandatory, it is a sign that you appreciate their hard work. 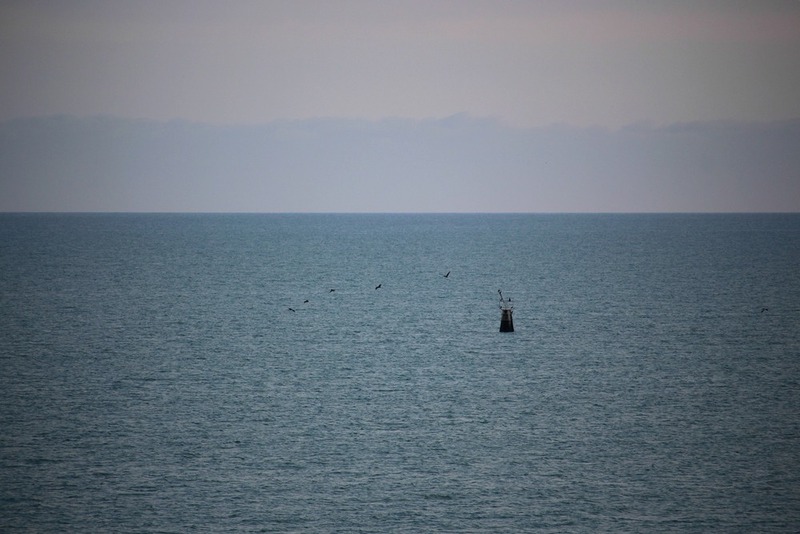 I looked out on our balcony one evening and saw these beautiful birds flying around a buoy. Most cruises have at least one formal night. Get dressed up and enjoy it! I was very sad to see on my cruise that only about 60% of the people on board got dressed up on formal night. Back in the days when people got dressed up just to get on an airplane, wearing your evening formal was the the norm every night on a cruise. Enjoy a little blast from the golden past and look your best! Lucy and Ricky will be very proud of you! This again falls into the category of “Things You Should Do Before Every Trip”, but holds true for cruising. Research your ports of call before you leave. I’m a history nerd, so I love to research everywhere I go. You can get so much more out of a destination if you know even a small amount of the history. Sure, Cozumel would still have amazing beaches if you knew nothing about the Mayans, but it makes the whole island much more meaningful knowing the stories of the ancient culture. Almost every cruise website will let you choose your shore excursions before you depart. These can be great (if expensive) ways of seeing the port with everything already planned for you. Some people prefer to go off by themselves, others prefer to have everything planned out for them. There is no right or wrong answer as we all travel differently. You can actually do both in many places. Many ports have both half-day and full day excursions. This is a great way to see the important sights during the first half of the day with a tour group, then take the last half of the day to explore on your own. My mom and I had a great time on our cruise! As this was my first cruise there were tons of things I was learning along the way, and that’s also part of the fun! Knowing the above tips will just get you off on the right foot and help to ensure you have a great time on your cruise! If you have any questions or comments, drop me a line at tylertravelstv@gmail.com. Check out this video with tips from my time on-board the Brilliance of the Seas by Royal Carribbean Cruise Line!